This is perhaps most important when it comes to committing yourself to selecting races, especially given the significant investment of money, time, and training that goes along with committing to a race. Our race reviews provide a snapshot of runners’ experiences at many events. It is also important to note that not every Casual Runner will have the same experience at the same event. This is why, at times, our Team has very differ opinions of the same race, and it is important to us that we share these opinions with our readers – all of them. Case in point, while I did not have a favorable opinion of the the 2016 Cherry Blossom Ten Mile Run, Jennifer’s experience was quite different. So we shared both sets of opinions so our readers – and the race directors themselves – could hear the whole store and make decisions appropriately. 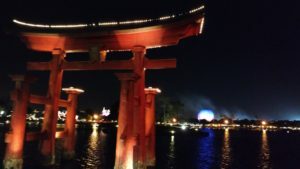 It was in this vein that, following the 2016 Walt Disney World Marathon Weekend, we published an article looking at the changes (for better or worse) at this events’ Hits and Misses. 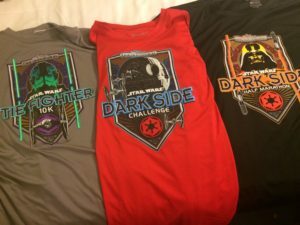 Jennifer and Candace shared their views and opinions on runDisney’s inaugural Star Wars Dark Side events, and noticed that they had very different experiences of the same event (seriously, go back and read their thoughts now, you’ll be glad you did: Star Wars 10k: Candace’s Recap & Jennifer’s Recap; Star Wars Half Marathon: Candace’s Recap & Jennifer’s Recap). See what we mean? Same event, very different experiences. 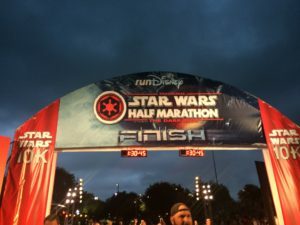 Given this, I wanted to share my final thoughts on this event by looking at the hits and misses of this inaugural event, and hopefully give both runDisney and Casual Runners some ideas for making futures events even more magical. Race Expo (HIT) – I am not generally the biggest fan of race expos. The fact that runDisney had me enjoying this one says a lot. 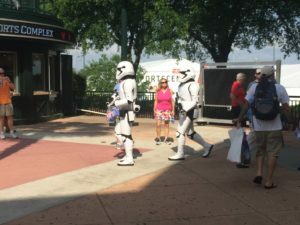 The photo ops, random Storm Trooper appearances, and overall theme made this an enjoyable experience. Event Merch Design (HIT) – Disney knocked this one out of the freakin park. I have never seen a better selection of merch at a runDisney event. Event Merch Sales (HUGE MISS) – Everyone knew that this was going to be a disaster, and it was. For the life of me I can’t figure out why runDisney doesn’t take reasonable steps to lessen the crowds (and accompanying chaos) by making all of the event merch available for online pre-order with pickup at the expo. They could even add a no return no exchange policy on all pre-order items. Regardless, something must be done about this, seeing grown adults push and shove to grab merch is definitely no bueno and leaves a bad taste in everyone’s mouths. Event Transport (HIT) – Aside from some misinformation on departure times, the pre-race event transport was as good as I’ve ever seen it at a runDisney event. As Jennifer pointed out, however, there were some issues with the expo transportation that need to be worked on. The Corral Walk (MISS) – For both the 10k and half marathon, the walk to the corals was CROWDED to say the least. it was less of a walk and more of a slow stumble. Even with this long slow walk, they were prodding us to load into the corrals way too early. if you don’t care about being in the front, there is no reason to get there that early, especially as there are too few bathrooms over there if you need them. So take your time. Early Wake Up Call (HIT) – I liked the earlier start times, and would like to see this become a “thing” for Florida runDisney events. Running in the dark at Disney is really cool (both in terms of temperature and runner experience), so the more of it the better. 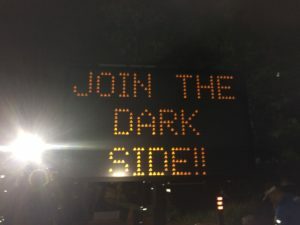 Also, frankly, with the Dark Side theme, these really should be night races. Fireworks (HIT) – The runDisney fireworks starts continue to be amazing. During the half marathon there was a misfire after my coral was released and I found myself completely surrounded by fireworks. It was AMAZING. I LOVED IT! On-Course Photos (MISS) – To be blunt, there were too few characters on-course. While I liked the set pieces, they really needed more characters. Is this a miscalculation or a #thankshanghai moment? Photo Pass (HIT) – This was the first event where runDisney moved from Marathon Photo to Photo Pass photographers, and it was fabulous. They did a great job of moving the lines when they could and the pictures in front of park icons were great. I also appreciated the green hunting tents they used which made the photographers even more visible on course. I cannot say enough good things about this change. Where’s Mickey? 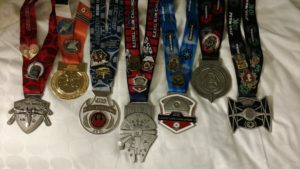 (MISS) – No Mickey Mouse whatsoever at a runDisney event? Come on! No Jedi Mickey? OK, I know the cross over characters have not been appearing in the parks lately, but what about classic Mickey with some homage to Star Wars? Just give us a little bit of Mickey at some point during the weekend. After all, it did all start with a Mouse. Course Design – Park Time (MISS) – There was way too little in-park time, especially during the 10k. Designing courses is a difficult task, but we wasted the whole first mile of both races on roads and backstage areas. Had we gone directly into Epcot (a reverse of the exits for the Marathon, Princess, and Wine and Dine courses) we could have saved some distance to be used to enhance the in-park experience. World Showcase in the Dark (HIT) – Running around Epcot’s World Showcase in the dark, with the torches list, Star Wars music blasting, and the pavilions all aglow is nothing short of spectacular. Boardwalk Congestion (HIT & MISS) – We knew going into this event that the section of course between Epcot and Hollywood Studios would be narrow, however, whether you experienced congestion or not completely depended on where you found yourself in the field. I did not have any problems, Candace’s half experience was OK, and Jennifer experienced heavy congestion. So it all depended on how you timed your arrival in this section. Wide World of Sports Finish (MISS) – The finish line location, which is unique to this runDisney race weekend was, in a word, underwhelming. There was no magic, no excitement, the races just seemed to end. 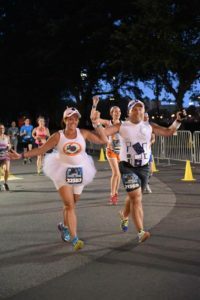 Because the races finished at Wide World of Sports, the park time was front-loaded in both races, which meant there was nothing to look forward to at the end of the race – that is the best part of most runDisney races, knowing that the last mile or two are going to be extra special and magical. These were not. Honestly, I would love to see them ditch the Wide World of Sports finish entirely and end near a park, any park. For the half marathon, once you left Animal Kingdom, the part of the race where you needed entertainment the most, the race was completely devoid of it. Wide World of Sports Post-Race Party (NEUTRAL) – I can’t say that I felt strongly one way or the other about this, but the crowds at the Wide World of Sports appeared to be much smaller than other race finishes at Epcot. I am not sure if it was because it is so hard to get to, but it was noticeable. Also, where were the beer sales after the half marathon? Event Transportation (MISS) – As I said above, race transport was great getting to the races, not so much getting back from them. However, they did seem to learn from mistakes at the 10k to improve them for the half marathon, so I give the staff huge props for making adjustments on the fly, but the lines were still very long and the delays noticeable. SMOs & Event Shirts (HIT) – Wow. Just wow. Top to bottom, I don’t know that I have seen a better collection of SMOs and event shirts at any race event, runDisney or otherwise. These were tremendous, especially the Kessel Run Challenge – its a freakin Millennium Falcon! Now, if only they would stop giving out rubber medallions for those 5ks. Oh, and short sleeve shirts that I can wear around Disney parks? Yes please! I have never seen runDisney do such an effective job of making a race’s theme so thoroughly immersive, which enhanced our overall experience. The Star Wars theme afforded the runDisney team with a great opportunity to stage a memorable event, and they certainly succeeded. Look, I know it was an inaugural event, and there are certainly many areas where this event can be improved (especially given the high price point), but I am excited for the potential this event has for future years. Lets just end the races somewhere other than Wide World of Sports.